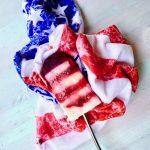 These cool, creamy, berrylicious, Red, White and Blue Vegan Popsicles are just the thing to keep the kids quiet while you chat with your friends at your Cook-out or Bbq. They are healthy! 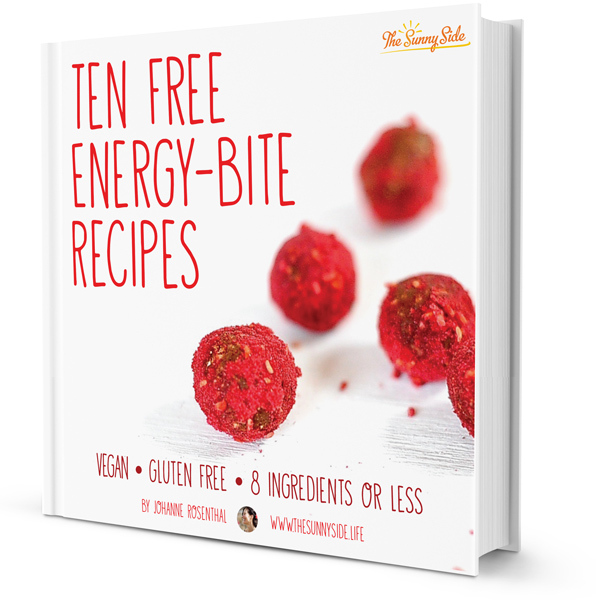 They only take three ingredients (blueberries, strawberries and plant based yoghurt)! What is the catch you ask? Well they take a good amount of fussing and freezing time but you can’t have everything. I made them at my leisure on a day I was at home. You could even make them over a few days. At first I struggled to make these as perfect as possible but that didn’t last long. I ended up loving the look of these: like an old dyed t-shirt where the colors run into each other. 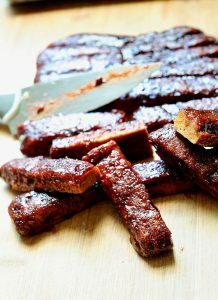 I’m looking forward to making these Sticky Tamarind Glazed Ribs for the 4th and finishing them on the grill. . I am not huge on patriotism towards any single country. Patriotism has led to a barrel of woe and strife in our world. But man do I love a birthday. The fourth of July is a fantastically fun birthday celebrated with firecrackers instead of candles. 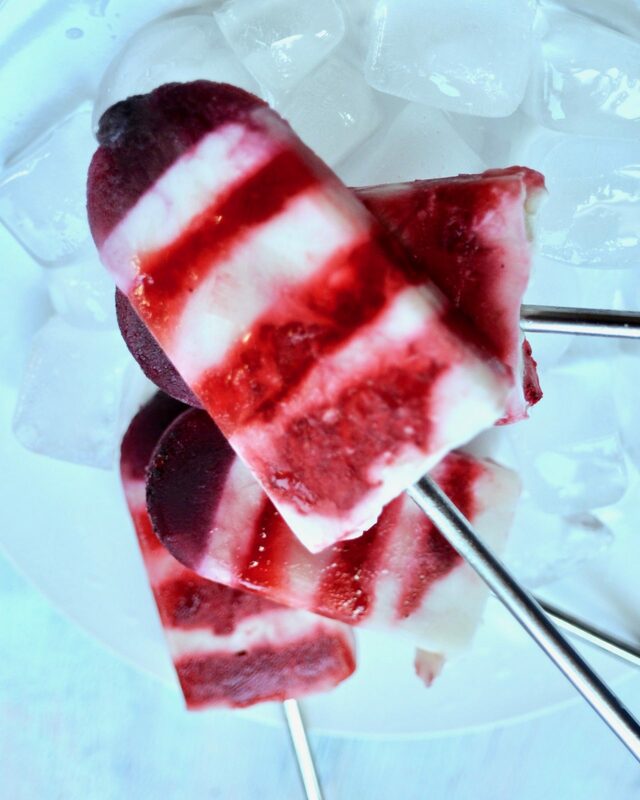 My 5 ingredient Red Wine Popsicles make for a wonderful adult treat in place of an after dinner drink. Maybe you are wondering what I used in the photos instead of wooden sticks? I used some gorgeous reusable steel straws that a friend gave me for my birthday. They worked perfectly. 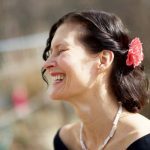 Here is a link if you want to take a peek at them. 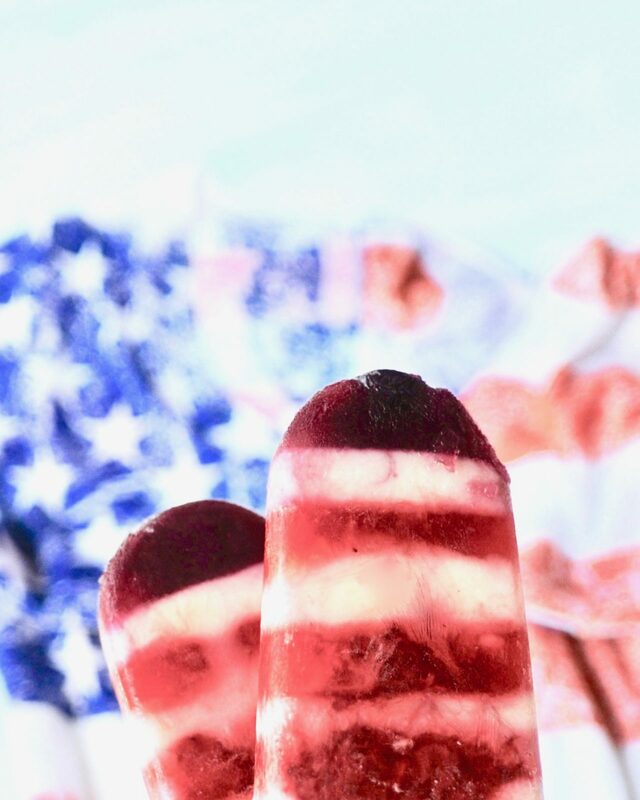 Red White and Blue Vegan Popsicles for the 4th of July! 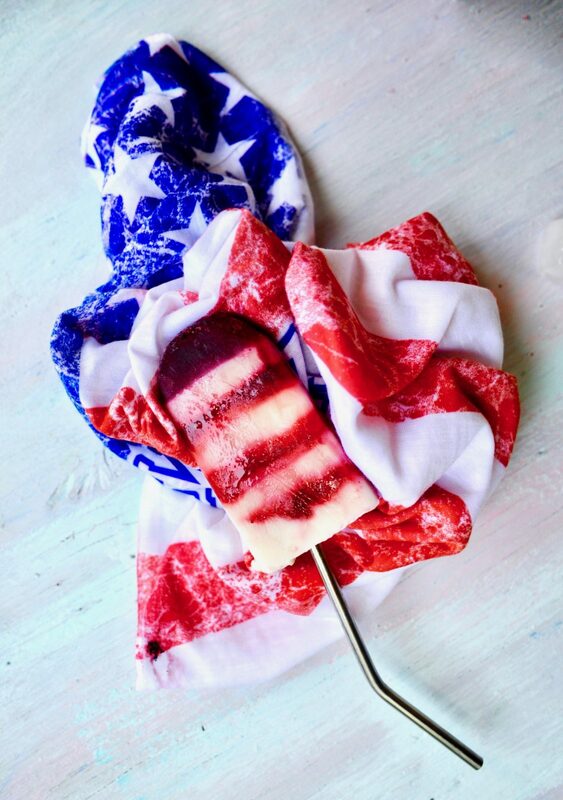 These healthy red, white and blue popsicles are the perfect thing to feed the kids for breakfast on the 4th of July. Puree the blueberries in a blender and set aside. 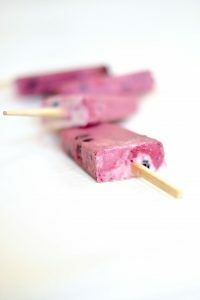 Stir 1 tbsp of the yoghurt into the blueberries and spoon equal amount into the bottom of your molds. I used 2 tbsp for each. Place the blueberry puree into the refrigerator to keep cold. Spoon some yoghurt into the molds. My molds took about 1 1/2 tbsp. Puree your strawberries with 1 tbsp yoghurt and spoon into the molds. Again mine took about 1 1/2 tbsp. Place molds in the freezer and the strawberry puree in the refrigerator to keep cool. Once frozen remove the mold from the freezer and spoon in another 1 1/2 tbsp of yoghurt. Continue the spooning/freezing process until your layers have reached the level that your popsicle stick will touch. Here is the somewhat tricky part. Freeze the first layer that the popsicle sticks will reach about 2/3 of the time as the other layers. Now jam the sticks into that layer so they stand up. Carefully put in the next layer of strawberry and place in the fridge. It might get a little messier at this point. I tried to have a prettier side and a messier side. Keep on layering and freezing until you have reached the top of the mold. You can see that I ended up with about four layers of white and three of red. Un-mold when ready to eat. 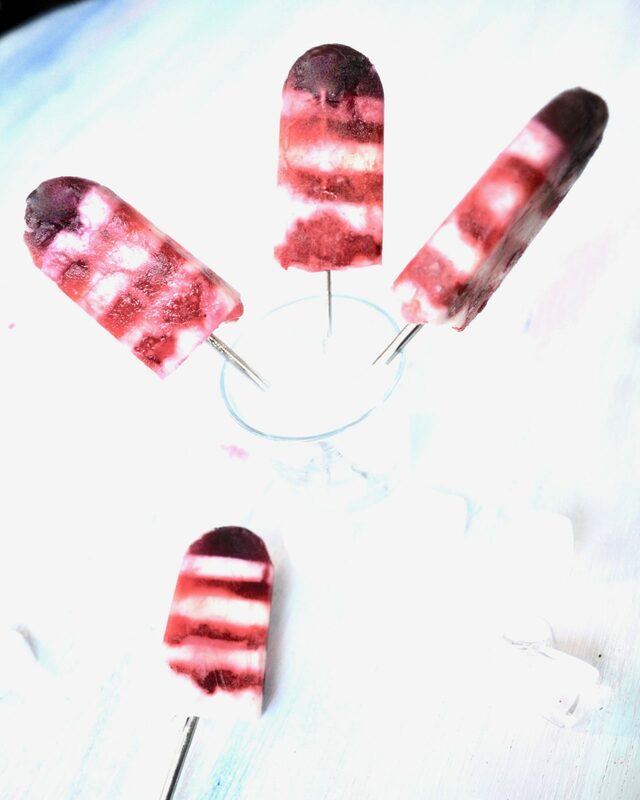 I love the look of these tie-dye popsicles. 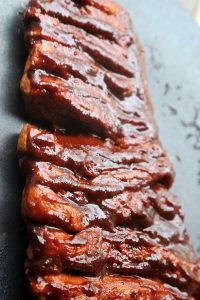 And the glazed ribless ribs.